During the process of writing the dissertation I’m supposed to be turning in chapters for my advisor (first reader) to look over, comment on, request revision, etc. Because of the nature of my dissertation, I decided to complete chapters 1-4 (out of eight chapters) and submit them all at once. I submitted those chapter in early March and on Friday, April 29th I sat down with my advisor to hear his recommendations. This was a very important meeting for me because early in the writing process I decided to take a bit of a risk and I wasn’t sure it would pay off. For those who have been in one of the Genesis Sunday schools I’ve taught over the past few years you are familiar with the main thrust of my dissertation. It’s about reading Genesis like a story that has a beginning, middle, and end. Of course people have been aware of plots since the beginning of time but ever since Plato and Aristotle we’ve had this idea that history and plot don’t mix. The result has been that we haven’t paid much attention to the plot of Genesis or even the Bible. Nowadays you’ll see more and more books coming out that talk about the story of Scripture or the plot lines of the Bible, but these books usually lack a solid methodology for dealing with plot. As a result there are lots of different ideas about what a plot is and how it works to organize a narrative. That’s where my dissertation comes in. My ultimate goal has been to show that plot is the highest level discourse or the organizing principle for the narrative of the Bible (and the organizing principle for biblical theology). 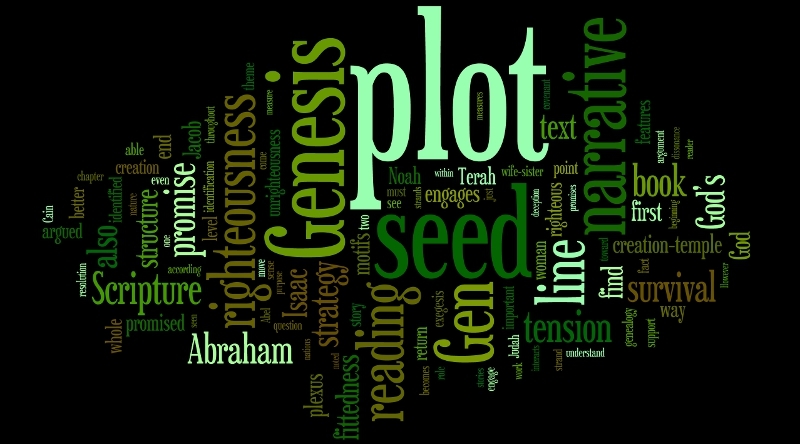 To do that, I started at the beginning with Genesis in order to show how the plot of Scripture begins in Genesis and how Genesis itself, while it sets up the plot of Scripture, also has its own beginning, middle, and end (plot). In order to do that successfully, I felt I really needed to develop a methodology for reading for plot. Not THE methodology, just some kind of methodology because it’s the methodology that serves as a control. In other words, I can’t just make up my own ideas; the methodology provides guidelines and limitations. As it turns out, that little project by itself took me more than one year. It took me into areas where I had no experience whatsoever. I was reading Plato and Aristotle and their views of mimesis, I got up to my ears in a debate in the philosophy of history on the relationship between history and narrative, and I got way over my head in the philosophy of Paul Ricoeur. I feel like I earned about three bachelor’s degrees in that year of research. Did it pay off? It’s hard to express the joy I felt after those first comments. I have to say that going in to that meeting I felt the whole thing could land anywhere on the spectrum from do over to great. After all the research I’ve done for this project it’s still over my head. The meeting with my advisor was a confirmation that I’m on the right track and need to stick to the course I’ve been following up until now–focus on quality over speed of completion. I’ve been discovering lately that my dissertation connects with the people in the pews and it connects perfectly with my passion for ministry which is to study, live, and teach God’s word to everyone in the church. People really do want to know how to read God’s word, how to understand it, and how to live it out in every day life. That’s the very thing that my ministry and dissertation are all about. With God’s help the plan is now to complete and defend the dissertation this year. Though I have submitted only the first four of eight chapters, I’m really much more than half way done. I like to say I’ve complete half the chapters, two-thirds of the pages, and four-fifths of the work. We appreciate your prayers for this process. Rejoicing with you! The sweat is beginning to pay off.